0800 : pickup from Kota Kinabalu hotel to Kinabalu Park. It may takes at least to hours to reach the National Park. Along the way you will stop at Nabalu Town- a place rich with local handmade craft. Take a chance to buy some souvenir to bring home. The park is the home to numerous interesting species of flora. 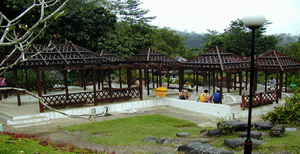 It is located at 1600m from from sea level with a soothing temepature. You may do these on your own or with a park naturalist, The Mountain Garden consist of a botanical garden and 9 connected trail, an excellent specimen of the entire Kinabalu Park area gives a wonderful sneak preview of the place. Evenings and early mornings at the park are perfect for bird watching with over 300 species known to inhabit the area. 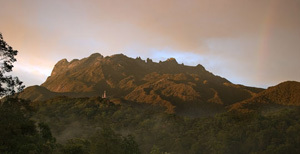 Kinabalu Park received the greatest recognition of its biological contribution when it was declared Malaysia’s first World Heritage in 2000. Pick up from your hotel in Kota Kinabalu and transfer to Kinabalu National Park. The home to numerous species of interesting flora & fauna. Guided nature trails with your nature guide. After lunch, a video presentation at Park's Exhibition Hall. Guided walk to the Mountain Garden to see rare collection of mountain plants and flowers. Remark : Exhibit Entrance to Botanical Garden/ Slide show(if available.refer to the guide) is on PAX account.